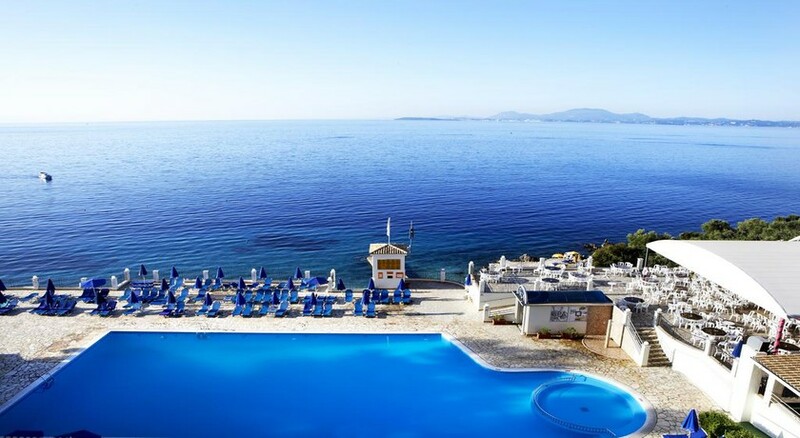 Sunshine Corfu Hotel & Spa is an all-inclusive family friendly hotel strategically located on a hill among olive and pine trees next to a gorgeous private beach on Nissaki Village. Overlooking panoramic views of the Ionian Sea, the luxury hotel features lovely pools, fine restaurants, kids´ entertainment, day activities for young and old alike, spa facilities, night animation and cool bars to offer guests a relaxed stay during their holidays in the Corfu sun. The well-appointed, contemporary air-conditioned guestrooms at Sunshine Corfu Hotel & Spa come with satellite TV, mini fridge and safe and a private balcony or terrace with magnificent views. 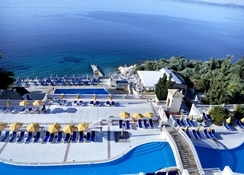 The hotel is located in North-East part of Corfu just 200m from the Nissaki beach. The Corfu City Centre is 25km away, while the nearest airfield Corfu International Airport is 23km away. 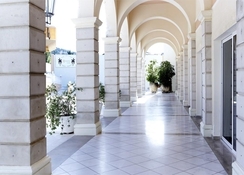 Sunshine Corfu Hotel & Spa has 313 spacious guestrooms in its main buildings, maisonettes and bungalows. Rooms come in types of double land/sea/garden view, family sea/garden view, junior suite, pool front suite, maisonettes and bungalows. The spacious, furnished rooms come with satellite TV, mini fridge and safe and a private balcony or terrace with magnificent views. This hotel celebrates gourmet dining with an array of Greek, Italian, international cuisine, theme nights and much more. The All-Inclusive includes all meals and beverages, the difficult part is making a choice. The Dionissos Main Restaurant serves all major meals in buffet style dishing out both Greek and international cuisine. Mama Mia is an Italian a-la-carte restaurant, serving up fresh Pizzas or a crisp salad. A bar with disco, pool bar and snack bar are also available to relax with a cocktail. 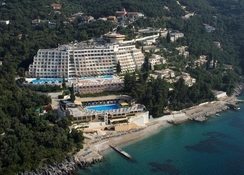 Sunshine Corfu Hotel & Spa has a swimming pool and kids’ pool and terrace besides access to the private beach. There is Yoga classes and a fully equipped gym for those who wish to stay active. There is the lovely 1000sq.m Aphrodite Spa with steam room offering delicate massages and therapies to soothe your body and soul.